On a chilly Sunday morning Walterstown welcomed Castletown to Oldtown for the first round of the League in this Division 3 encounter. Walterstown under the guidance of a new management Team of Joe Treanor and Martin O Connell were looking to turn around Walterstowns fortunes for the 2019 campaign. The first half was a largely uneventful affair with Joey Coogan opening the scoring for the blacks very early on, and the fact that it was another 20 minutes before Walterstown scored again, via the boot of Barry O Connell. A lacklustre half ended up with Castletown going into the break one point ahead. At the break Walterstown made a change with Sam McCabe replacing Conor O Sullivan, and Sam almost had an immediate effect with a goal bound effort that rattled the crossbar. 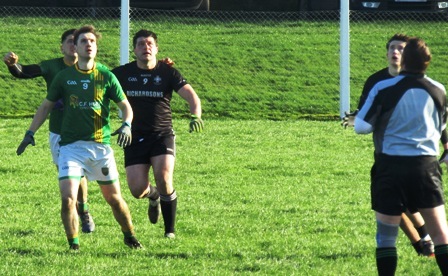 Again Joey Coogan was the first to register a score, which was quickly followed by another point from Brian O Connell, which put Walterstown back in the lead. Walterstown did have the better of the play in the opening stages but this was undone by a Castletown goal half way through the first half, which was followed immediately by another point from Castletown. Cathal McGuinness came on as a substitute for Mark McCormack, just before a fine point from Colm Reilly reduced Castletowns lead to two points. Castletown registered another point just before the match was levelled again after some good play from Walterstown saw Brian O Connell find the back of the net. The momentum was now with Castletown and again they retook the lead with three further points, two of which were just before full time. Walterstown now needed a goal and despite repeated attacks it didn’t emerge, and Joey Coogan reduced the Castletowns lead to two points before the referee called a halt to proceedings. Subs Sam McCabe for Conor O Sullivan, Cathal McGuinness for Mark McCormack, Dan Halligan for Christopher Farrelly.Adam Barrett, Conor Lenehan, Eoin Finlay, Luke Cullen, Ciaran Murphy, Eoin O Mahony, and Michael Donnellan.